We love a project that presents a puzzle for us to solve. THOR engaged with the American Institute of Aeronautics and Astronautics (AIAA), the leading association in the aerospace field, to tackle a problem familiar to many associations: How do we expand our flagship print publication into a digital edition without harming our existing subscriber-based revenue stream? At the onset of the project the print version of Aerospace America was visually outdated and difficult to produce. The overall layout was redundant and the templates made custom design work tough to implement. The digital edition consisted of a PDF-based flipbook that lacked functionality and was hard to read on desktops and nearly impossible to view on mobile devices. The journey to a new Aerospace America started with data generated from a reader survey conducted by our partners in the project, McKinley Advisors. THOR expanded upon key findings in the initial report through a series of discovery sessions with AIAA staff and key constituent groups. We examined feature requests for the new Aerospace America site and made recommendations for single-sign-on (SSO) capabilities, social media integration, and proper hosting requirements for a WordPress-based digital property. Our discovery illuminated the need for holistic change across Aerospace America’s editorial process to facilitate the addition of a digital edition. In response, THOR introduced a cloud-based collaboration process using Box.com and Adobe’s InCopy/InDesign tools. These new tools help editorial, design and digital teams to exchange versioned copies of individual content blocks in a structured, real-time environment. We have a knack for sifting through content and finding the key that unlocks the big picture idea. With a new editorial process in place, THOR worked on delivering a modern design for the print edition and a matching responsive microsite for the digital edition. We redesigned the magazine to take full advantage of the outstanding photography available in the aerospace industry. We created a feature well that is visually distinct based on scale and typography from the department pages. This basic design principle adds emphasis to every monthly feature and intuitive structure to the overall publication. THOR also employed methods of breaking long stories into smaller, less daunting, content blocks. We clustered utilitarian sections of the magazine into a single content block and wrapped that block at both ends with vibrant imagery. Detailed navigation elements throughout each issue and numerous entry points helped to complete the visual transformation. THOR began styling the digital edition once the print design was nearing completion. This provided us real-world feedback from staff and readers on the acceptance of the design concept. THOR iterated development of site sections of Aerospace America using a clickable prototype rather than a series of static comps. Prototypes are proven to best demonstrate a real user experience, much more than is possible with a static proof, and are a critical tool in our seamless web development workflow. The microsite design we produced follows best practices for long-form online reading. We went to great lengths to provide readers with an intuitive site that is easy to read on screens of varying widths with search and navigation functions that make locating specific stories and subject matter easy. The digital version of a magazine and the print version must compliment each other — but they are distinctly different beasts. Many publications decide to place their online content within the framework of the organization's parent site. 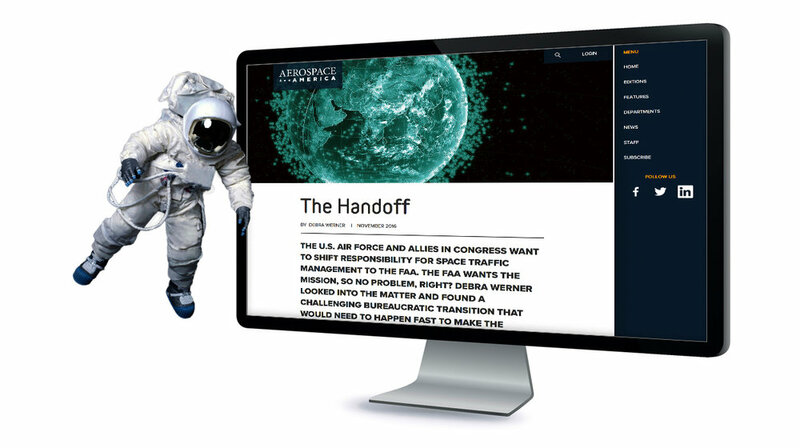 It was our recommendation that we build a responsive microsite based on WordPress for Aerospace America — a site that is purposefully separate from the parent AIAA site. Doing so allowed us to create styles, navigation, and content types specific to the publication. The overall experience represents the spirit of the Aerospace America, with undercurrents of AIAA present in the branding. We choose WordPress because of its large development community and great editorial user experience. Both are key considerations for publications like Aerospace America, whose editors will interact with the CMS on a regular basis. THOR used a modern software stack to compliment our WordPress development. The site’s modern look was based upon the Roots.io base theme system combined with custom page layouts from the Advanced Custom Fields plugin. These foundational elements allowed for the use of cutting edge front-end development tools in a WordPress-friendly environment. The development process took our clickable prototypes with component-based sections and quickly mapped them into the base theme, resulting in rapid turnaround times when going from prototype to coded site. We heavily utilized the local development tool Kalabox to accelerate rapid deployments of the site across staging and production hosting environments, giving the Aerospace America team regular previews of our progress. Extensive testing required for the netForum-based single-sign-on system created many challenges during this build but was aided by switching into the WP-Engine hosting platform, which also gave the site global reach and performance enhancements with a complimentary CDN. We’re here to help our client's projects thrive over the long-term. The agility and quality of the system THOR created has allowed Aerospace America to become a source for up-to-the-minute aerospace industry news. THOR produces the print edition of Aerospace America on a monthly basis and works closely with the editorial team on all visual aspects of the publication. We also continue our support of the Aerospace America site with an agile-based sprint cycle of additional feature deployments performed on a monthly basis.